Castaway's is a small, friendly, family run hostel located just 2 minutes from the city. My Husband and I have been in the local Tourism Industry for 15 years together. We are conveniently situated near the supermarket, bakery, pub, local shops and esplanade. Our newly refurbished hostel is clean, quiet and comfortable. Small dorms and no bunk beds, and our rooms are spacious as well. We have both shared and private facilities for your comfort. Chill out by our swimming pool surrounded by palm trees, or just relax with your favourite movie and a cup of tea or coffee. Available to all our guests is the BBQ area, large clean kitchen, TV and DVD room, free internet and use of computers. We have experienced tour and travel advice with special deals tailored for each individual. 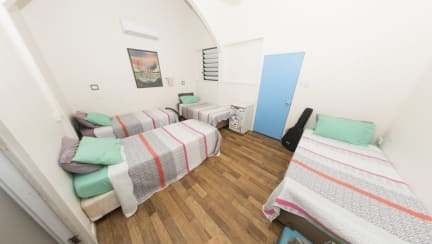 All rooms have professionally laundered crip linen, inner spring mattresses, in room storage units, ceiling fans & air conditioning and a fridge. En-Suites also available. 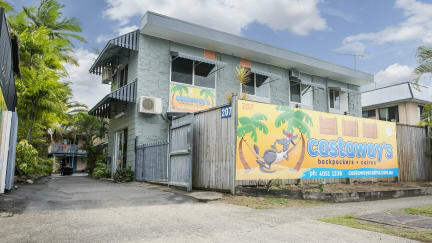 Every night you stay with us at Castaway's we provide you with a free evening meal at the World Famous Woolshed Backpacker Bar in the heart of Cairns. The meals are from a set menu and for $5, $7 or $8 you can upgrade to the full menu. We of course offer you free Internet and WiFi, and a free courtesy bus! Even though Castaway's is only 10 min walk to town we provide a courtesy shuttle, from early morning until early evening, to ferry you to town. We also provide a free pick from the train station and the bus transit terminal between 7.30am and 7.30pm.